VIRGINAL CO ORDINATES with EYVIND KANE, SINFONETTIA CRACOVIA, etc. LABIRYNT with ICTUS ENSEMBLE, POLISH RADIO CHOIR, etc. Since he arguably invented rap metal (but don’t blame him – no one could have anticipated Kid Rock!) 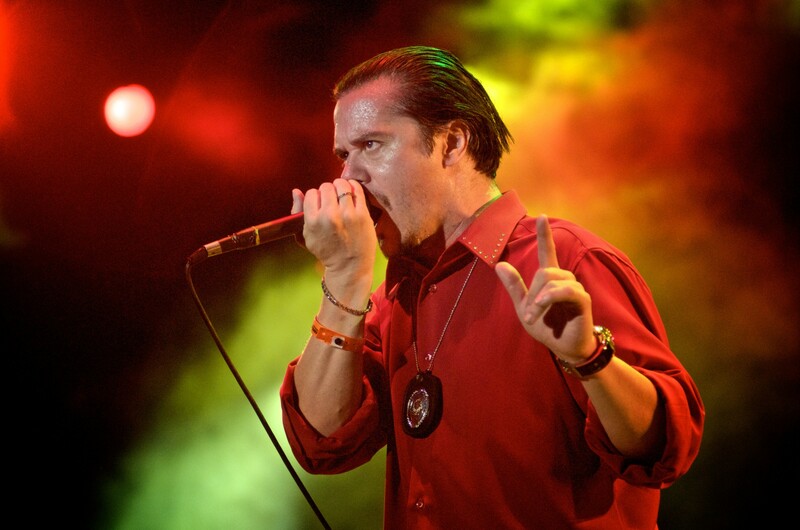 on Faith No More’s “Epic,” he’s had a career trajectory that’s included scoring films and founding record labels to collaborating with everyone from John Zorn to Björk to Slayer’s Dave Lombardo in a variety of experimental music projects too numerous to detail here. But Patton is a completely unique experimental Renaissance man, and these two totally different performances that climax this year’s SACRUM PROFANUM festival are happening nowhere else in the world, and in fact are Patton’s only concerts of 2016. On Friday night, he’ll be performing a new arrangement of Eyvind Kang’s 2004 avant grade jazz suite, Virginal Co Ordinates, and will be joined by violinist Kang, Tomek Mirt on modular synthesizer, Anna Mamińska and Hubert Połoniewicz on tambura, and the Sinfonietta Cracovia. Since the mid-1990s, Kang has released a dozen albums under his own name, as well as another 30 or so in various collaborations with the likes of such downtown jazz legends as Bill Frissell and John Zorn. He’s also recorded for Patton’s Ipecac record label. Saturday night begins with Karlheinz Stockhausen’s 1970 electronic piece Für Kommemde Zeiten, but the main act is a performance of Patton’s 2012 recording, Laborintus II, which itself is a version of the Luciano Berio/ Edoardo Sangieti piece Laborintus from 1965. In Patton’s hands, the music has been described as a combination of San Remo pop and Dadaist metal, and the libretto borrows from T.S. Eliot, Ezra Pound, and Dante’s Inferno for its themes of “memory, death, and usury” (as the composer once said.) But be forewarned, this isn’t ‘music’ in what you may think of as the traditional definition – although it certainly has elements of avant garde jazz, it is best defined as that blend of found sounds, electronics, and some acoustic instrumentation known as musique concrète. Georges-Elie Octors and Szymon Wyrzykowski are the conductors of the Ictus Ensemble and Polish Radio Choir, and Jérôme Noetinger will be operating the tapes. Patton himself has said that he couldn’t turn down this rare opportunity to do such unique shows back to back, and considering the amount of preparation required for concerts such as these, he is clearly passionate about the art for its own sake. Let’s face it, he could be out making a killing on the festival circuit with Faith No More singing music from 20 years ago. Either of these shows would be a coup to any music festival in the world; it’s a real credit to SACRUM PROFANUM that they pulled off such an exclusive. When it comes to Polish metal, it doesn’t get any bigger than BEHEMOTH (pun intended). For the last 25 years, they have positively defined that often extreme genre known as black metal through many trials and tribulations, and endured everything from (sometimes successful) attempts by the church to ban their concerts (because of, you know, Satan) to band members getting cancer, and yet have always managed to live to fight another day. There was a strange moment in the 1990s when swing music and rockabilly became really popular for about a year or so. Punks, goths, garage rockers – all were suddenly attracted to the jumping jive rhythms of artists like Big Bad Voodoo Daddy and Lou Bega with their channeling of old masters Louis Jordan and Louis Prima. If Warsaw’s THE REAL GONE TONES had been around at the time, they could have ridden the trend to great stardom (of course, they were probably still in preschool then.) They have the sound and the look, sure, but more than that, they have the serious advantage of the voice and presence of singer Marla Marvel, the epitome of a charismatic Rockabilly Queen. With two full length albums and an EP in less than two years, their live set is a fun combination of obscure cover versions and original songs, and as you can see in this clip, they are a party. Known to most Poles simply as ANIA, her newest album Dla wainwych marzycieli (For Naive Dreamers) is the latest in a string of #1 platinum records (in fact, only one of her six albums has failed to reach that status), and she is one of the most (Poland’s Grammys) Fredyryk-nominated artists of all time, winning eight since her debut album in 2004. Hers is a kind of quirky pop music, often infused with a dose of 1960’s era retro sensibilities, and she is known to be a dynamic live performer. BEDNAREK is ostensibly the name of the band, but make no mistake; the focus is on its namesake, 25-year-old singer Kamil BEDNAREK, who first rose to prominence as runner up winner on the Mam Talent! TV singing competition, the success of which catapulted his band Star Guard Muffin’s 2010 album Szanuj to #1 on the Polish charts. After the band broke up, he put together BEDNAREK with a couple of other ex-members, and their 2012 debut Jestem… was also a #1 as well as going platinum, currently making them Poland’s most successful reggae act. Their style tends to be the more sunny, cerebral, sensual kind of reggae, and if you’re looking for a last wistful glimpse of summer, this is it. Poland’s love of reggae is a fascinating thing. It seems incongruous, but somehow it really does make sense. This video of BEDNAREK’s excellent cover of the classic Marek Grechuta song, “Dni których nie znamy,” is a perfect example of how Poland and Jamaica share (as someone once said) One Love.